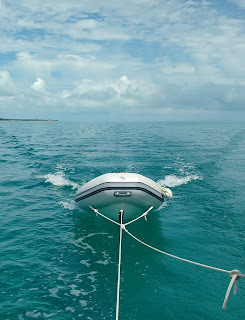 Dinghies take you to remote places such as Hawksbill Cays. This is dinghy #2. A few of you have been asking about this so it is time for the telling of the sagas of the dinghies. The story begins back in Palm Beach, Florida earlier this spring where we were anchored for a protracted stay while we dealt with a variety of paperwork issues, including renewing a passport, renewing Layla’s documentation, and taxes. It all demanded a post office, time and patience - endless patience as documents were lost, re-sent, and bureaucracy frustrated all reason. 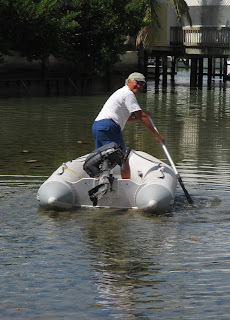 We were anchored between the Flagler Memorial Bridge and Royal Park Bridge in an area known to have strong tidal currents that would reverse 180 degrees with the flow of the ebb and flood tides. When combined with storm winds, these currents can challenge anchoring skills. On one of these occasions, Bud saw a trawler galloping toward a recently anchored motor vessel. He shouted to Tracy that he was taking the dinghy to alert the captain about the danger. Bud called the captain on deck and together they attempted to fend off the trawler as it became tangled in the anchor chain of the motor yacht. The trawler lost part of the stern swim platform in the event but otherwise did no damage to the other vessel. Soon, a Sheriff Patrol boat assisted as the trawler continued dragging towards the Flagler Bridge while Bud departed. The trawler was retrieved soon after by the owner before the Tow Boat contractors arrived to salvage the vessel, and before the boat impacted the bridge. Back at Layla, Bud saw the dinghy was leaking water around the transom in the area that had been repaired previously on our trip to Marathon, Florida. It was apparent that the aggressive maneuvering had opened the repaired seam. 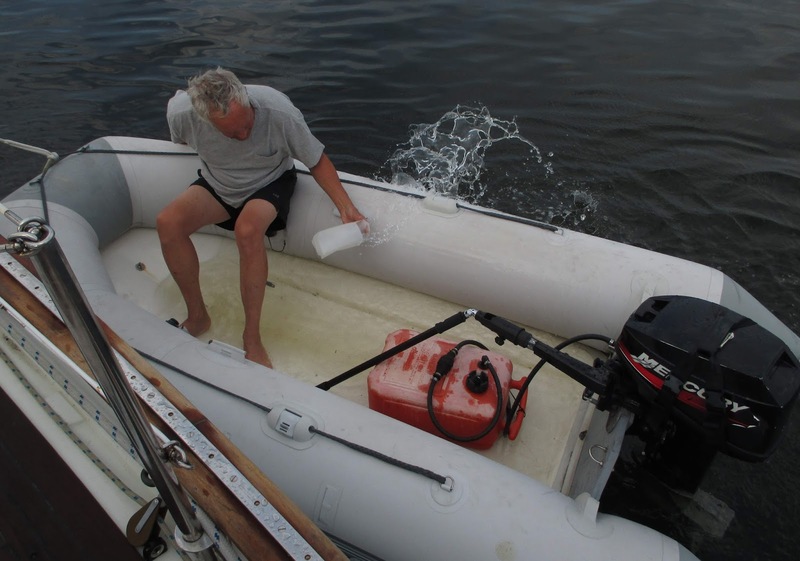 Such repairs are common on older inflatable boats and they seldom last. If we wanted to have trouble-free boating, we would need a new dinghy. Dinghy #1. Daily bailing of the leaky dinghy became old very quickly. A HUGE boat show was coincident with the dinghy problem. Imagine a boat show where they bring in docks to accommodate hundreds of boats including 200+ ft. mega yachts! 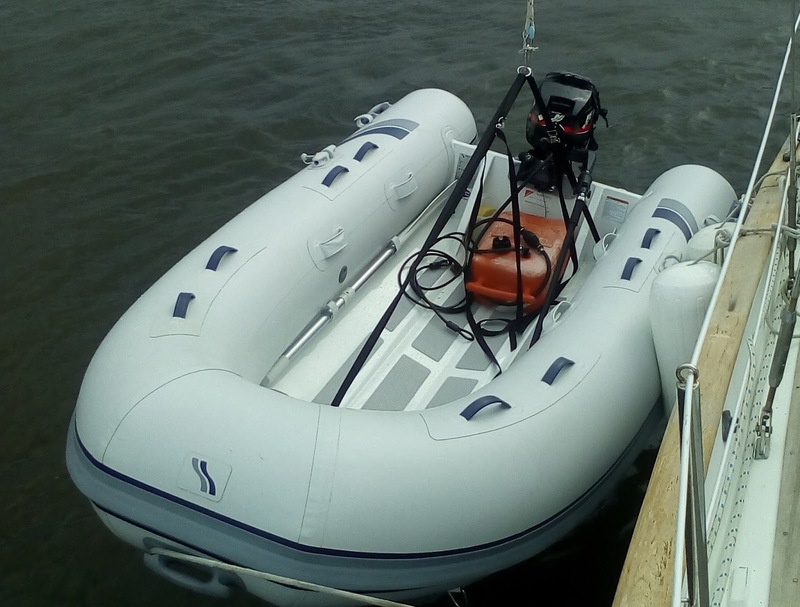 We found a brand new dinghy at a good price (Highfield 310) and the company (Inflatable Boat Pro) agreed to take the old dinghy for repairs and to sell it on consignment. The new dinghy proved its worth some weeks later in another wandering boat incident. Bud and the local sheriff rescued a sailboat that had dragged anchor and was headed toward the Royal Palm Bridge. The owners, who were not onboard, later showed their appreciation for saving their boat by paying for a couple of nights at the Pier 66 marina when we sailed south to Fort Lauderdale! We dearly loved our new dinghy. It was fast, dry, stable and lightweight. Dinghy #2. Our beautiful brand new, non-leaking, fast, dry and gorgeous dinghy. Move now to July and the Abacos, Bahamas. 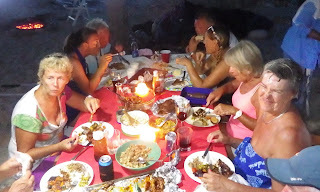 We were living the cruiser’s life as we had connected with a number of other sailors and began to have quite an active social life. One evening we joined our South African friends and others for a “braai” (Afrikaans for barbeque) on the beach at Lynyard Cay. Along with several other dinghies, we secured our dinghy by burying the anchor high on the beach. After a good time of dinner, fireside chats and frivolity, it was time to head back to our boats, at about 11:00 pm. Our dinghy was gone! We found the anchor in the water about 20 feet from where it had been buried on the beach with no dinghy attached. There was no frayed line to show that the line had been cut. Although the anchor had apparently dragged, the line had come “untied”. We searched in two dinghies until 2 am with no sightings. Early the next morning, we searched again for hours in the coves and bays, and anywhere as we tried to guess, with wind and current, what was the most likely path of the wayward dinghy. Marita, Holli, and Shirley enjoy "Sundowners" at the braai. Collection of sailors gathered for the braai on the fateful night. Good food and fun at the braai. 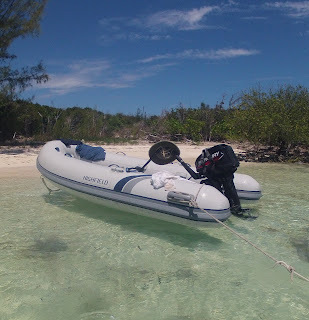 It is devastating to lose a dinghy, not just because of the cost, but because we were stranded - No beachcombing, no snorkeling, no shopping, no fun. Our friends came to our aid in the true spirit of cruisers everywhere. They called us on the VHF radio each day to pick us up to go ashore for walks, beachcombing, snorkeling, and sundowners. They looked after us and kept us with the group. But we did NEED a dinghy. We made repeated announcements on the VHF, the local cruisers’ net and the pubs popular with boaters alerting everyone about the missing dinghy. As the days passed we realized we needed to go to plan B. We called marinas and boat repair shops to ask about used dinghies for sale. 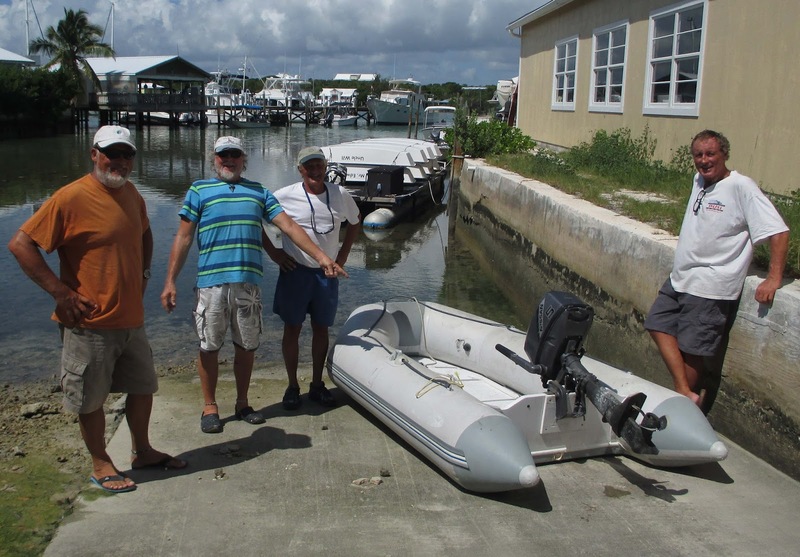 One day, we received a promising response from Edwin’s Boat Yard on Man O’ War Cay informing us that they had “one inflatable boat for sale”. The “gang” was eager, hopeful and assembled for a trip to town. We were led to a building with dinghies stacked one on top of the other. The upper dinghy from one stack was hauled out. It was an older West Marine inflatable with a removable floor. It had “a slow leak” we were told. “Water or air?” we asked. Probably both, we surmised as we got no clear response. It was quickly re-inflated with an inverted vacuum cleaner hose and, you know, it looked pretty good. White glue trails around the seams told us it had been repaired in much in the same manner as our old dinghy. Well, at least we understand that problem. “Does it have a motor?” someone asked. (It was so great to have a team to back us up.) Yes! A Nissan 5 hp 2-stroke motor was pulled off a stand and transferred to a tank filled with water. After a couple of quick pulls on the starter, the motor smoked but sprang to life. The carburetor might need a little attention. We discovered the internal fuel tank was secured by only one of three bolts, but that was OK as long as the engine cover was on. The gas cap required duct tape to keep it from falling off as the threads on the tank were stripped. We would need some more duct tape for the cap. 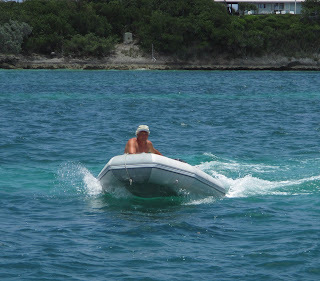 But, we are in the Bahamas and we need a dinghy. The “gang” began to nod in agreement, “This is OK”. 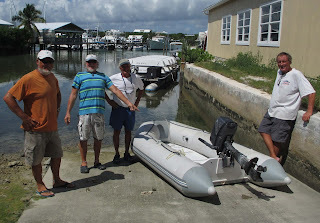 The "gang" (John, Alan, Bud, and Tony) checking out the "new" old dinghy (#3) just purchased in Man O' War Cay. We walked to the office and, as advised by the collection of sailors, we made an offer $200 less than the asking price. The friendly office lady said, “The owner won’t take less than $450”. We said, “Well, $450 it is. Will you take a check?” The office folks had a short discussion and said, “Yes, we will take a check, but it will be $5.88 for the bank fee”. We smiled, agreed to the fees and wrote the check. Consider this - we are in the Bahamas. Man O’ War Cay has ONE bank and it is open only on ONE day, Wednesday, from 11:00-1:00! We were buying a boat on Thursday, which meant that it would be DAYS before they could cash that check - a check that was from ANOTHER COUNTRY and from people on a SAILBOAT - from people who are on the move and can skip out of the country anytime! The wonderful people at Edwin’s Boat Yard did not even question that! They are clearly from another time when people are trusted on their word. 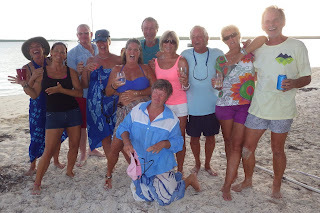 We love Man O’ War Cay! Bud taking Dinghy #3 for the first ride. Actually, it wasn't as bad as it looks. The engine did run, he just needed to get into deeper water to lower the motor. Dinghy #3. It was a wet ride, but when she warmed up, she was fast if no one else was in the boat! It remains a mystery where dinghy #2 is. Possibly, it is wandering the open Atlantic Ocean with a full fuel tank, a good-running 9.9 hp Mercury outboard, a 25 foot anchor line, and two pairs of our favorite flip flops. Clearly, someone will be very pleased to find this little boat. 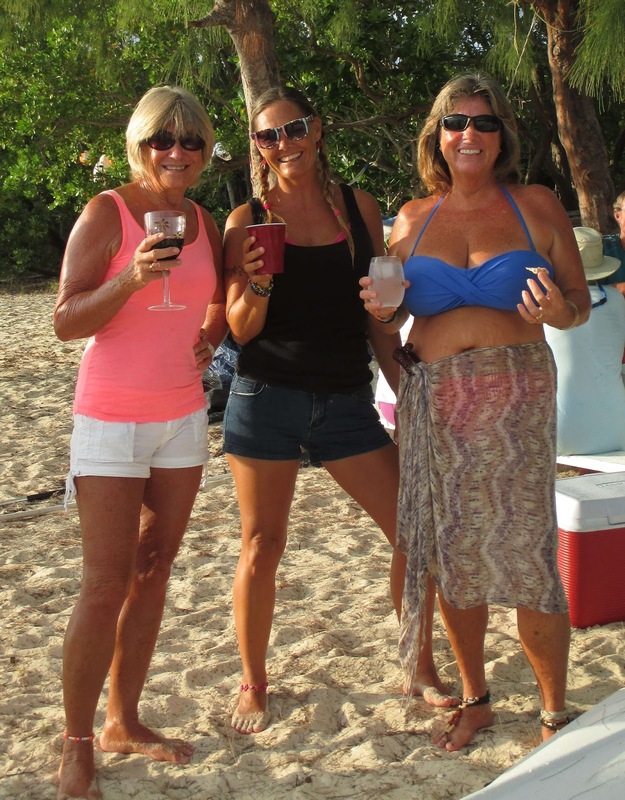 It is also a mystery as to what actually happened on the beach at Lynyard Cay. It is a puzzle how the anchor ended up 20 feet from the beach. Possibly, in the chaos of one of the groups departing and boarding their dinghy earlier in the evening, someone tripped on the anchor line which contributed to the dinghy breaking free to wander the planet. Regardless, one fact remains - the anchor line was free, not cut, and so the simplest explanation is Bud’s knot on the anchor failed. So be it. Click on the picture above for a link to the song "Come Back Dinghy". “Danke” (thank you) John and Shirley on Kaya Moya, Tony and Robyn on Alley Cat Too, Alan and Marita on Alley Cat, and John and Holli on Shiloh for your friendship! We look forward to meeting up with you again somewhere, sometime. I will never look at a dinghy quite the same way!